Kapp's remarks on his teacher Wiechert. Later, Kapp studied “state science” (Staatswissenschaft: consisting of law and economics) at the universities of Berlin and Königsberg. As early as 1933, Kapp and Lili Lore Masur, his wife-to-be and co-author, left Nazi-Germany for Geneva (Switzerland), mainly because of Lore’s Jewish background and their humanist consciousness and political beliefs. In Geneva they were acquainted with the Frankfurt School that temporarily exiled in Switzerland, and Kapp contributed to the Planning Debate with his dissertation Planwirtschaft und Aussenhandel (1936). His dissertation’s main argument was that a planned economy is not doomed to autarky, because there are ways to deal with the valuation problem so that trade and exchange with market economies can be organized. Kapp’s dissertation demonstrated his early interest in issues that are characteristic of his later work: alternative accounting methods, accounting problems in market economies, the valuation of substantive human needs, environmental degradation, and democratic governance of science and technology. In 1937 Kapp received a scholarship from the Frankfurt School, which had emigrated and was now situated at Columbia University (New York City) under the name Institute for Social Research. This allowed the Kapps to move to the United States of America, where he worked at Columbia University, New York University, the City University of New York, and Wesleyan University in Connecticut for almost three decades as lecturer, assistant professor, and full professor. There is evidence that Kapp took interest in the developing discussion between the German intellectuals at Columbia and those German economists who formed the new graduate faculty at the New School. The economist of the Institute for Social Research, F. Pollock, had been his close friend since his dissertational work and was also a close friend of A. Lowe, who was by then a leading economist at the New School. Kapp’s work from this time shows the influence of the Frankfurt School, i.e., M. Horckheimer, T. Adorno, and especially E. Fromm, as well as that of the leading social scientists K. Goldstein, A. Maslow, K. Polanyi, P. Tillich, and W. Weisskopf, to name but a few. Importantly, at this point Kapp’s European research background started to blend with American intellectual movements, particularly those exemplified in the American Institutionalism of T.B. Veblen, and J.M. Clark, and the Pragmatism of J. Dewey. This creative intellectual environment was ideal for the development of Kapp’s institutional ecological economics, which began with his most famous book The Social Costs of Private Enterprise (1950). This book was later revised, enlarged, and published under the title The Social Costs of Business Enterprise (1963) to indicate the Veblenian spirit of the work (cf. The Theory of Business Enterprise). In 1971 the original version of The Social Costs of Private Enterprise was published with a significantly enlarged introduction by Kapp, reflecting the latest stage of his argument on social costs. The second main strand of Kapp’s work sprang from his interest in integrating social science, leading to the publication of “Towards a Science of Man in Society” (1961), a work of large scope, ranging from economic and cultural anthropology to the behavioral sciences. Between 1958 and 1964 Kapp and his wife undertook three research journeys to India and the Philippines, during which they laid the foundations for ecological development economics. 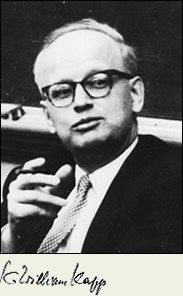 Applying the theory of social costs to the problems of economic development, Kapp’s “ecological development approach” can be considered a forerunner of “sustainable development.” During this time Kapp also corresponded with G. Myrdal and adopted his principle of “Circular Cumulative Causation” as a research hypothesis. 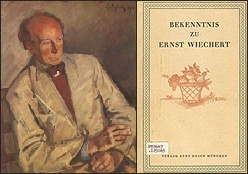 In 1965 Kapp received an appointment from the University of Basel (Switzerland) as incumbent to E. Salin, the notable political economist, student of the younger Germanhistorical school, and European humanist in the tradition of J. W. Goethe. Kapp spent the academic term of 1972-73 as visiting professor with Ignacy Sachs’ research group for development planning at the Ecole Pratique Des Hautes Etudes in Paris. The ensuing environmental debate of this period eventually led to the “discovery” of Kapp’s prescient work. Notable among his achievements in this period were his membership on the “expert committee for environmental and development issues” of the United Nations that prepared the environmental conference in Stockholm in 1972, as well as his chairing of the German governmental research panel on environmentally sound technology, which published its report in 1974. In the late 1960s Kapp applied L. v. Bertalanffy’s open systems theory for the conceptualization of the development process, and integrated this in the 1970s with N. Georgescu-Roegen’s work on the economic process as an entropic transformation process. In 1976 Kapp suffered a fatal heart attack during a conference in Dubrovnik, Yugoslavia. Today the Kapp Archive hosts Kapp’s manuscripts and documents, and several associations award Kapp Prizes, e.g., the European Association for Evolutionary and Political Economy (EAEPE) and the German Association for Ecological Economics (VOO). Kapp’s work has had several followers, among whom his assistant R. Steppacher, J. Martinez-Alier, and James Swaney are the best known.